I'm so thrilled to be a part of this special day and to help to get the word out about Cards for Heroes and their very important cause. If you happened to have stumbled onto my blog in the middle of the Hop, please visit The Memorial Day Blog Hop to start at the beginning. I only wish CFH was around when my husband served oversees, I would have loved to have received a handmade card from him during our time apart. Not only am I a former dependent wife (USMC) but I was also born on Traditional Memorial Day. I've always held a special place in my heart for this holiday with it's rich meaning honoring our Military Personnel of past and present. So for me, it's all about saying Thank You to those who serve! 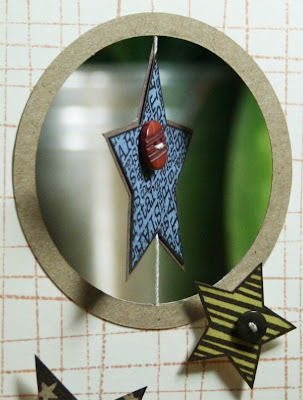 I made a card with a peek through window which has a star suspended by string. I strayed from the typical red white and blue by using rust, cream and blue instead. I hope you enjoy! And here's a glimpse of the inside. I added a strip of paper vertically then added some fun details to hold the message, then I ran it through a quick stitch on my sewing machine. Here's a close-up for you of the suspended star. I ran a string between the two layers of the star, then I poked a hole in the top and bottom of the circle, threaded the string and secured the ends with Glossy Accents. The paper rings hide the small holes. Blue Paper and Buttons: Basic Grey, Beige Dot paper: Bo Bunny, Corrugated paper: The Paper Company, Circles cut by: QuicKutz Silhouette, Journal Tag: Heidi Swapp, string and sewing supplies. The next stop on the hop (which I happen to be very partial to) is the Hero Arts Club Blog. Hero Arts is doing a giveaway today PLUS on Monday we are having a very special treat! You've just got to check it out. Your card is stunningly beautiful Shari! Thank you for sharing about what these cards mean to you from personal experience too. Beautiful card, Shari! I just love the unique creativity you bring to all you do. Thanks for your support of our military! I'm a Marine mom; my son is currently serving in Iraq. Gorgeous card, Shari. Love the spinning star! Awesome card!! Love stars!! Keep creating and giving!! Have a SWEET and SAFE Memorial Day Weekend!! Very unique! I have never seen a card like this. Love, love, love it!!! WOW!! Such a stunning creation!! Just love the dangling stars!! TFS!! love the hanging star...great idea! Love the card. I am always amazed at your creations. Great; love the gratitude for those who serve! What a cute card! I like the non traditional colors! That star is adorable! This card is so beautiful and fun! Love the twirling star! Fantastic card! I'll be trying the hanging star. Love how you suspended the star very cute, awesome card Happy Memorial Day! Love the colors and the inside is just as nice as the outside! Thanks for sharing your card so I could hop in! Wow! I really like your card!! Brilliant idea of the suspended star in the window! I love the colors you chose and know this will be a card cherished by the lucky person who receives it. Your card is fabulous!! Many thanks to you and your dh for your service and sacrifice for our country. My own Pop, Gunny was a 20 year USMC. Semper Fi! Thank you so much for participating in the CFH program and the blog hop! BTW your 'Cede is one beautiful furbabe! Great card...wow, fantastic! Thanks be to your hubby for serving! God Bless you! This is SO cute! I LOVE how creatively you did the star with string. The non-traditional colors were a GREAT addition too. Love, love, love the window in the front with the star-- so clever!!! That card is so creative! How fun! Thanks for sharing your beautiful card! Fabulous card....love the detail on the star. Love it! The star is so cool! What a great idea! awesome card! I've gotten such inspiration from all of you. Hi, Sheri! So good to see another kind of Hero(Arts) here, too! Great card, Shari! Love your style! I happened to check your blog on Thursday.....so glad since I discovered the info about the CHF blog hop. I signed up for the hop, too. Well done! And most important of all... Long live the Heroes! What a beautiful card! I love the suspended star! LOVES your card with the suspended star and thanks for all the close ups of details. More importantly, thank you for all you have done to support the military for our country! awesome card ... love the spinner and your layout! Beautiful card and I love your personal connection to the cause! Love your cards! and as a spouse of a currently deployed solider I will say that I am sure someone will be very grateful to receive these! I will definately be looking into helping out, as DH just complained to me the other day that the only cards they have in their makeshift PX right now are graduation and birthday! Wow - this is stunning. Love that star Shari. 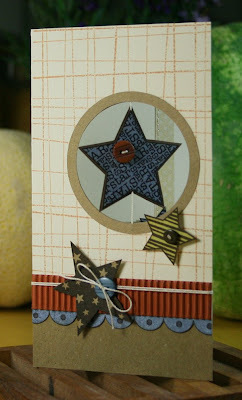 Love that card - love the stars and the spinning - cute cute! Happy Birthday weekend. Thanks for helping with this event. I am a military Mom. I know how something from home means to the soldiers. WOW! That is a fabulous card! I have added a link to this blog hop and the CHF youtube video on my blog. I hope it brings many more people to participate in the wonderful group. Great job; love the extra details. Fabulous card! I love all the details! I LOVE your card - so warm and sweet. My DH was USMC too. Thanks Shari for not only participating but also for teaching me the suspended star thingy. Very cute. I just love the non-traditional colors you've used. Realllly nice. Gorgeous card! Have a wonderful memorial day weekend! Very creative! I love your card!! I like the rust color and cream. It's a nice change up from the classic red and white. Beautiful card, and I love your words of inspiration! Such a fabulous card Shari!!! I'm so enjoying this hop! I love seeing all the beautiful cards! God Bless our troops! Love the floating star! Great card - any hero will love to send it. This is a really great card. I love the suspension of the star. Thanks for sharing. Great Card. I loved the suspension of the card. What a great card! I love all the added details. Such a pretty card!! Thank you for remembering our troops! Now I've got to get creating! what a lovely card. Very stunning and I'm sure the soldier that receives it will truly enjoy it. What a wonderful card! Great work! Your card is gorgeous!!! Thanks for sharing!!! Your card was so fabulous, great job! Love the suspension card and the alternate colors are great. Your card is so wonderful! I love it! Awesome card! Thank you for supporting our troops! I think I remember us having the same birthday... May 30??? :) Happy almost birthday :) As a kid, I was always telling people my birthday was on Memorial Day, too. How funny! 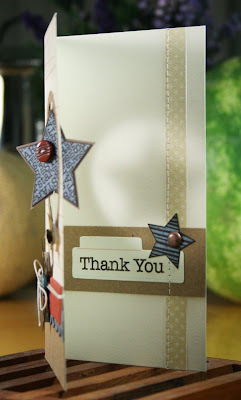 I REALLY like your card with the suspended star... going to have to try that very soon! what a neat card.. u inspire me! Very nice--I like the Kraft paper! oh my word! What a beautiful card! Great card, so fun! Thanks for supporting our troops! I love your unique color choice for your hero card. Really classy! And as a new Navy mom, I especially appreciate your contribution! I love your card. It's a wonderful tribute to some special people giving their all! I am totally blown away by all the creativity on this hop. What a wonderful use for your talents-blessings to all. Thanks for sharing your story and your card. That is really creative. wow! You have made an awesome card! Thanks so much for the idea and construction tips. HAPPY BIRTHDAY! WOW--your card is amazing and so unique! Love it. Awesome card! I have never done one with a window or used string like that and LOVE the look. Must try something similar. Thanks for the inspiration! Off to the next blog! Happy Memorial Day weekend! Great idea suspending the star like that. Thanks for the inspiration. This card is AWESOME!! I especially love the suspended star. Thanks for participating in the hop. Blessings. That is a beautiful card. Thank you. Your card is so beautiful.. thanks for make cards for heros! getting to see such talented ladies in their work and blogs. I am a twice USMC Mom. I can relate to your sentiments for this good cause. I love the change up in colors of the flag, and how you hung the main star to have movement. Also the message inside and techinque is high-five! great. Fabulous card, love the shadow that the spinner gave in the 2nd shot. Fabulous card Shari! Thanks for the inspiration...I think it is time to try a suspended card! Thank for all your support over the years to the military! Great card. Our son is a Marine, home this weekend for a four day leave......yeahhhhh. Thank you for making cards for our heroes. 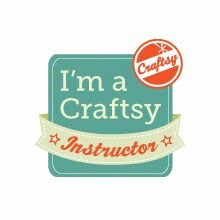 I was just going through my craft stuff this am, and I think I have some cards to donate for this cause. Fantastci card! Love the spinning star! Very creative. Thanks for sharing! That suspended star is so cool! I like the non-traditional colors that you used. This is one awesome card and just love the details you added. I think the blog hop is an amazing event. My family and I will celebrate Memorial Day by making some cards to pass along to the troops. Love this! Super pretty card. Love the star that moves! Very pretty card. Love the suspended star! 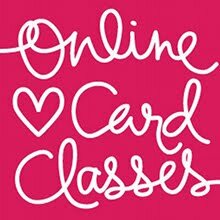 Love your card. The attention to detail inside and out is wonderful. Must try the floating element - thanks for the instructions. And thanks for your contributions to our service men and women. Love love love your talent! Love the suspended card. Thanks for participating in this special project. WOW! I love it and truly admire the details. Great job! Great card - love the non-traditional colors too. This card is awesome! Love the suspended star! I adore the details in your card!! I'm really going to have to try suspending a shape and I love the extra you did on the inside. It makes the card that much more special. I love the way you suspended the star. Fantastic spinner card...love your card and I know someone will really appreciate it. It's a great mission/service you are doing. Thanks!! WOW! I just love love love the star in the window Shari! This is so very beautiful, I love the idea of hiding the string with a ring too, how cool is that! Thank you for your husband's service - and YOURS! The families at home serve and sacrifice too. We appreciate you! Thanks for joining in this crazy wonderful bloghop! Gorgeous card. So many special touches and I love your color scheme. This card is absolutely amazing. Thank you for sharing your story as well. Thanks for sharing what this cause and the holiday means to you, it was very inspiring! Beautiful card for a great cause. We can never express our gratitude enough for these Brave Men and Women who serve! I have found so many new blogs through this blog hop. Love your card and love your blog! very eye-catching card; love the non-traditional approach you took. Most EXCELLENT artwork!! Love it! Very nice! I like the interactivity of the card. Totally awesome! It's been a long time since I've made a card like this. Very cool! I LOVE your card in the non-traditional colors! I am so inspired to use some of those colors to make my own creations. We're so glad to have you on the hop today, and thank you for your support of Cards for Heroes! Hope you are having an awesome memorial day weekend! The suspended star is really cool! I like your star window. What a great idea! I am going to try it. Thanks for sharing it. Love your card, that is great! Thank you for doing the cards for heros! Always love your work, Shari! Love the earthy tones and the star spinner! Thanks to you and your husband (and all the other heroes and their families) for your sacrifice on behalf of our country. LOVE THIS CARD! You did a wonderful job! What a great card. Thanks for sharing it. I LOVE your card! I am always attracted to cards the either "do" something or have some sort of 3-D element to them! Great card and what a fabulous cause. We've had a similar thing running over here too. Lovely job on your card. I love how you used the star in the middle. Fantastic card for a fantastic cause. very cool card! This blog hop ROCKS for it's purpose and content!! Thanks! SUper cool! I really like that style and it's done in the perfect color scheme! Happy Birthday Shari! Love your blog. You are so talented. Saw on Jen McG's that you are having a big birthday. I turn 40 next Sat. I don't know abt. these big birthdays. But really I'm just happy to be here. Hope you have a fabulous day!!! I did a google search of your name when I recievied a box of cards from Operation Write Home at my deployed location. My favorite one in the box was yours. It had a pair of cherries on it with the caption "sweet treats." I thought I'd try to find you online to try to thank you for taking the time to send in a handmade card. It's beautiful and I am inspired and looking forward to volunteering for OWH when I return. Thank you from the bottom of my heart. I participate in the Simon Says Stamp affiliate program and receive a commission when products are purchased through links on my blog... At NO additional cost to you. Making Spirits Bright Blog Hop and Giveaway! Comfort and Joy Coming at You!! Thanks for visiting! I'd love to hear from you. Leave me a comment when you can.